10:11 am – My phone rang. It’s was brother-in-law. I promptly hit ignore and rolled over in bed. In Bed? You say. Yes, in bed. As in, it was after 10am and I was still sleeping. I don’t know what came over me at that moment, but I decided to check my phone for the time. You see, I thought my brother-in-law was calling way too early, so I angrily ignored his called. Um, no! It’s a work day. I COMPLETELY overslept. I literally fell out of bed when I saw the time, sent some hurried email to my coworkers explaining my insane tardiness (I believe the email included swear words) and ran so fast into the shower that I felt like the police were chasing me. 10:48 am – I walked into my office after exiting the oh-so-stuffy NYC subway, literally holding my breath in anticipation of the air conditioning when, on that beautifully sunny 82 degree day, I was met by a huge blast of hot, stale air. You guessed it – our air conditioning at work was broken. Most normal people would march their tuchas straight out of the office and work from home. Not me. Not us. Today we suffered! Oh, and to make matters worse only the A/C on our floor was broken. FML. I chuckled out loud and then started my day. By the way, I still had not had coffee yet, which is what inspired this oh-so-necessary flavor: Skoffee. Some of you may be having “Deja Brew” right now, thinking that this flavor sounds vaguely familiar. Well, it’s because it’s loosely based on the Ben & Jerry’s Coffee Heathbar Crunch flavor. Only better. I should tell you that it didn’t get any cooler in my office, and in one of my oh-so-kvetchy moments I mumbled under my breath, “at least I’m having ice cream tonight.” That, my friends, is the silver lining to 365scoops! Not a day goes by without a few scoops (or half-a-quart, but who’s counting) of ice cream. Oh, and to add insult to injury, I forgot to photograph the final product and therefore you can’t actually see how delicious this ice cream looked. I’m so sorry. You’ll just have to make it for yourself instead! 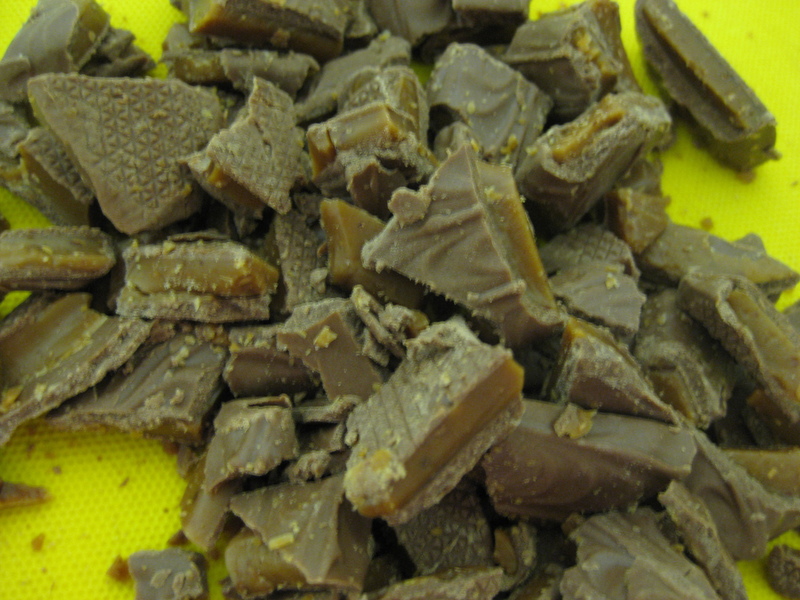 Four Skor (ha ha, get it, "four score and seven years ago") on the Floor! Chop the four skor bars. 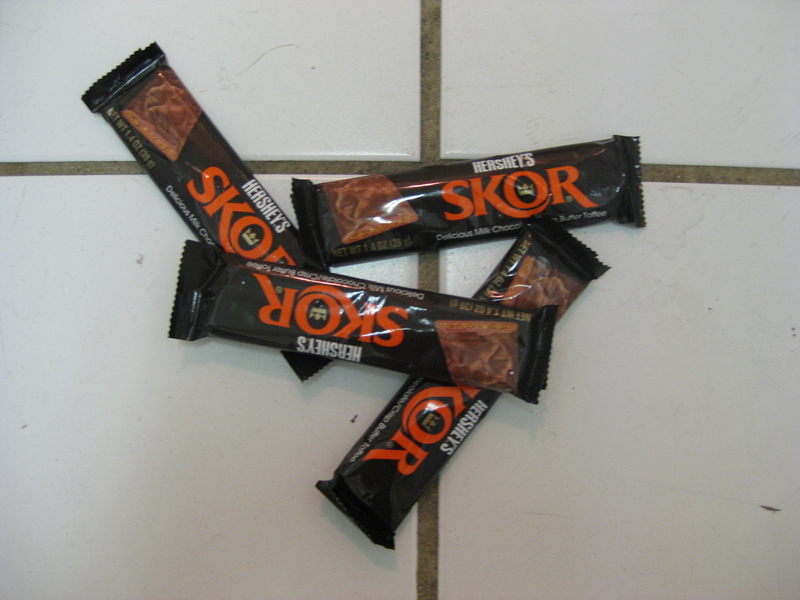 As you can see on the right, I actually dropped the four skor on the floor to “chop” them! I got this idea from Ben & Jerry, who said that when they first started making Heath Bar Crunch ice cream, they would stand on a ladder and throw the candies onto the floor to get the correct bite-sized pieces. That’s just what I did! Once they’re broken in pieces, take out of the wrapper and freeze. 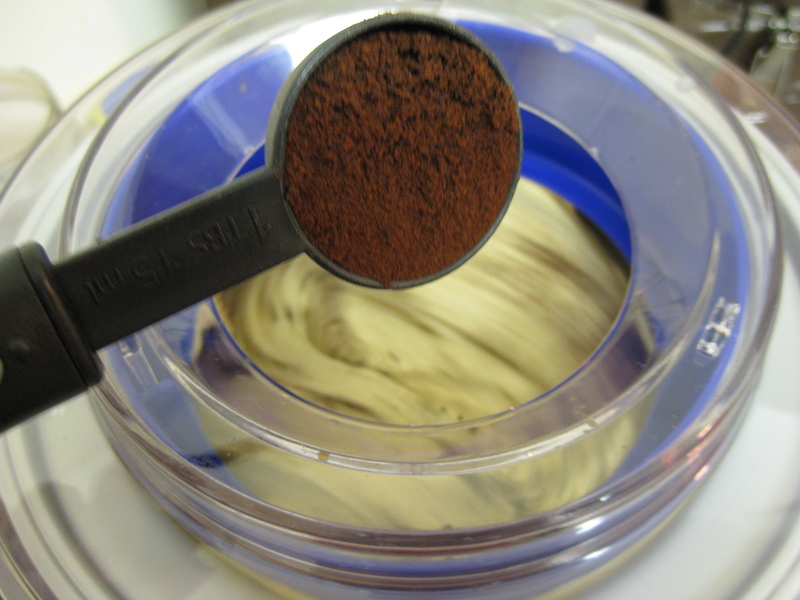 In the meantime, whisk together the milk, sugar, and 2 tbs of instant coffee. 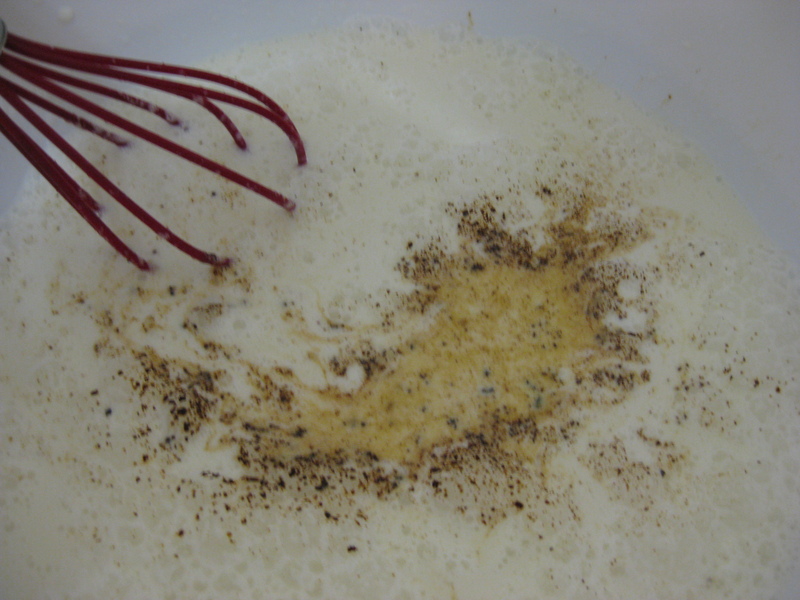 Pour into the bowl of an ice cream maker and churn according to the manufacturer’s instructions. Five minutes before the ice cream is done churning, slowly add in the skor bar pieces and the last tbs of instant coffee. When the ice cream is done churning, put into a freezer-safe container for at least 2 hours before serving. The Verdict: Score! Yes, that is exactly what some people said when eating it. Pretty cute, huh? My only regret is that I don’t have a photo of the finished product. That’s what happens when you leave me in a room with 8 people and a quart of freshly churned ice cream. Can you blame me?